...If this is something you'd like to learn more about, I'm hosting Michael Badnarik and his Constitution Class in Mckinleyville, CA, this summer. I noticed it in a response made to the original post. First I've heard about it. For those that don't know, Michael Badnarik was the 2004 Libertarian Party candidate for U.S. President and is supposed to be a constitutional scholar of sorts. Hasn't seemed to have done much other than that, though. I understand he couldn't afford a hotel room at the convention back in 2004 so he slept in his car or some such. I've been corresponding with a gal supposedly from a TV network that has a show where they have three Japanese folks traveling around trying weird foods. She wants to do a show on banana slugs. Anyone know of any recipes for banana slugs or any local places to dine on them? Seriously. There used to be a Russian River banana slug festival but I don't know that they do that anymore. Thought there was one somewhere else...maybe Crescent City, but can't find anything on that one. Anyway, any suggestions can be posted in the comments. Here's her last note to me. might help us prepare some banana slug delicacies? Thanks for your kind assistance." This was one I was leading toward standing aside on. Now, I'm pretty sure I'm voting Yes on it. Prop 16 is the one that would require a 2/3 vote for a local government to enter the retail electricity business. It doesn't prohibit governments from selling gas or electricity, as I've been hearing many opponents suggest. It just requires more than a simple majority vote for a local government to do so. The Orange County Register made their case today as to why, while not perfect, Prop 16 is worth passing. The controversy over KMUD radio's drug bust reports made today's Santa Rosa Press- Democrat. Well, you have to give Mike Hislop some credit. He's smart enough not to catch a bunch of heat like Bonnie Neely did from myself and some others for holding a campaign fundraiser in Sacramento. Looks like he'll be having his supporters from outside the county fly in to a fundraiser at Murray Field. Breakfast for $25.00. I guess I can't argue with that. Why didn't Bonnie think of doing this? John Seiler, over at California Watchdog, recently took a look at how much money the state could save by suspending all the voter approved spending initiatives. I suggested he should also consider looking at how much we could save by recalling voter approved bond initiatives. He did, and here's his report. His findings were not what I expected. I'd expected to see possibly tens of billions of dollars in savings if we could pull unsold bonds- the High Speed Rail bonds being a big one- off the market. What I hadn't considered was that the bonds are paid off over periods of 20 to 30 years, so it doesn't appear pulling the bonds would have as much impact as I'd thought. Yet we're still talking about spending over 47 billion dollars in bonds not yet sold and with bonds certain to be approved by Californians in the future, you can bet we'll be looking at tens of billions of dollars more in debt. Seiler points out in his report that, just on current bonds the payments will rise from over $11 billion in 2014 to over $19 billion in 2027-28. The percentage debt payment will take from California's general fund will rise from 6.71% in 2009 to to over 9% in 2027-28. That actually doesn't look so bad, when compared to the hundreds of billions of dollars the state is on the hook for in unfunded public pension debt. Don't I look great in camo? This is back in my National Guard days. Not sure who it is on the left, but I'm second from left. Tom Sauls next with Doon Louie on the right. This would probably be back in the mid to late 80s. Not sure where the picture was taken. My guess is Ft. Lewis, Washington. Yep. They say only 22% of Americans have confidence in the federal government to do the right thing. There was a poll on the CNN web site earlier this morning (can't find it now) where they asked, "Should the FDA set national standards for salt added to processed foods and prepared meals?". Last I checked, 70% of the people had voted Yes. Thanks to J.D. Tuccille for the link to the graph. I was surprised to see this AP story show up in the Times- Standard this morning. 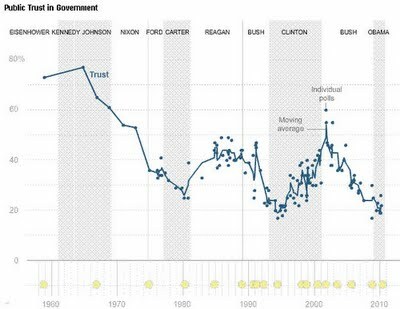 Good or bad news, depending on one's perspective: Only 22% of the people polled trust the federal government to do the right thing. I'm rather skeptical of the results. It would seem to me if so many people felt that way, incumbents wouldn't have such a high re- election rate. Steve Greenhut makes his case for why liberals should be concerned about the growing public pension crisis. I think he does a good job, but I'm not a liberal. Zombie attended the San Francisco Tea Party event. Another fun read as she takes a look at plans and results of attempts by The Left to infiltrate the party. I didn't attend Karen Brooks' campaign kick- off yesterday. After reading that it started of with the Pledge of Allegiance and an invocation, I'm glad I didn't. I hate both the Pledge and prayers. I assigned Rose to go there and report on it for the local blogosphere but she disobeyed and didn't go. Did anyone reading attend? The Times- Standard reports there were "several dozen" people attending. Is that accurate? Just curious. I ragged on Mike Hislop's campaign kick- off when they reported several dozen at that event and I was pretty sure there were far less. Might as do the same for the Brooks event, except I suspect she had more people show up than Hislop did. Oh, and Joy Finley tells me there were around 800 people attending the Tea Party at the courthouse but KIEM TV only reported 100. Anybody attending want to make their own guesstimate of how many people were there? Looks like quite the gala event, that Tea Party protest held down at the courthouse yesterday. Humboldt wasn't alone in the Tea Parties, either, with numerous similar events held around the country. Around 10,000 people supposedly showed up at the one in Pleasanton, CA. This is a good thing. It used to be just a handful of Libertarian Party members, along with a Republican or two, would show up for Tax Day protests. Now it's thousands of people. I'm surprised that they've received pretty decent press coverage. The Contra Costa Times gave the Pleasanton event good coverage as did the Sacramento Bee for the Sacramento event. The best thing about the Tea Parties, though, is how they piss off the left wingers so much. It is really fun to read or listen to them seething over this. I suppose I shouldn't be surprised that even CLS, over at the Classically Liberal blog, is all annoyed by them, too. He's always had a thing for conservative types. I'll disagree with CLS that these events aren't the least bit libertarian oriented. The overall message of less government and less taxes in our lives certainly leans strongly libertarian. Whether it's just a passing fancy just because there's a Democrat in the White House remains to be seen. If I live long enough to see a Republican in the White House again and the Tea Partiers are still there, then they might just be here to stay. That would be a good thing, especially if they adopt the libertarian's personal live and let live philosophy along with their desire for low taxes and smaller government. If that happens, maybe I'll join them. Karen Brooks, citizen candidate, is challenging a career politician to win the people’s seat and bring common sense leadership back to Sacramento. A 30-year resident of Humboldt County and small business owner, Karen and her family reside in Bayside, California. Following the Tax Day Rally at the Courthouse, Karen Brooks will introduce herself to voters and kick-off her campaign. A brief press Q&A will follow Brooks’ comments around 3:45pm. Tri- City: Worth A Read? I guess it goes to show how often I actually even casually look at the Tri- City Weekly. I just noticed today that they've included stories and such you can read and not just advertisements. Wouldn't of looked at it today except the wife was browsing through it and noticed an article on Eureka's fortune telling family. She pointed it out to me because I used to do gardening for their home years ago. 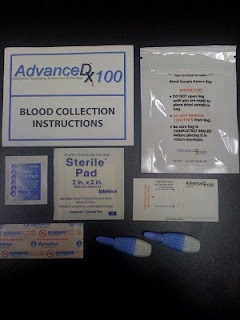 Some of you might remember my mentioning a home blood test I found so you can test your blood for some things without paying hundreds of dollars. Well, I tested it almost two weeks ago and got the results today. So, a little over 2 week turnaround time. About what I expected and not that bad considering I would of paid a minimum of a little over two times what I paid for the same test to have it done at one of the local labs. Pretty neat how the test worked. You just use one of the auto needle injector things to prick the tip of your finger. Put about 3 drops of blood on the gauze filled sample card. Let it air dry for 60 minutes and put it in an airtight envelope with dessicant inside for shipping. They even provide a postpaid return envelope. As for the results: Not as good as I'd hoped for, but it showed my triglycerides down from what they were before. In fact, almost half what they were last time. Hope it's accurate. I understand these tests are 95% as accurate as the "real" tests done in labs around here. Not sure how to read that since I am consulting a physician... well, kinda. Still, seems to me these kits could be useful to folks like me that can't afford to casually pay $100.00 or more for a test like this. I think they're quite affordable and can be quite useful. Hey, if you can't afford regular blood tests, at least these tests might let you know if there's something you need to be looking at in regards your health. I'm going to take the Crestor pills the NP gave me last time I went to the doc's office. That's supposed to lower cholesterol and tryiglycerides. After a few weeks I'll take the blood test again and see if there's any changes in my blood lipids. If not, than at least I don't have to worry about paying over $100.00 a month for a prescription for the damned stuff. If it does lower my cholesterol, not sure what I'll do. I can't afford to pay that much a month for just one prescription. The test is nice and inexpensive, though. So this guy, who was kidnapped from Ukiah and held prisoner for years as a young kid, was helped in his escape by Steven Stayner. Does that last name sound familiar? I thought so. His brother, Cary Stayner, was the one who killed our very own Carole and Julie Sund and Silvina Pelosso in those horrible murders in Yosemite back in 1997. Join us in southern Humboldt for a south of the border experience. Come out and meet Mike Downey, the best candidate for Humboldt County Sheriff. Largely ignored by the press and most politicos over the last decade is the unsustainable pension system we have for public employees in California. Some, myself included, have been trying to sound the alarm over this for some time. Now the situation has ripened and more and more newspapers are starting to cover the issue. It seems worse now than anyone had imagined. The Daily News reported a couple days ago on a study done at Stanford University that showed California's public pension system- that's government employee retirements, for those of you in Arcata- is currently underfunded by more than half a trillion dollars! I guess that means we're all gonna have to find a way to come up with $36,000.00 to help keep the system solvent, huh? Actually, this makes the state general fund problems look like child's play. I don't see how this is fixable no matter who the next governor is. When last polled on this subject, over 75% of Humboldt County residents expressed concern that campaign donations have an undue influence on elections. This public outrage was used as justification in 2006 to pass Measure T that instead of reforming local campaign finance laws, unfairly disadvantaged local businesses over labor unions and nonprofits, resulting in a 2008 summary judgment finding the ordinance unconstitutional by the federal court. 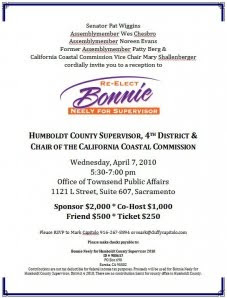 One of the proponents of Measure T’s “local control” was 4th District Supervisor Bonnie Neeley who is holding a re-election fundraiser in Sacramento on April 7, asking for $2,000 “sponsorships" and proclaiming that there are no contribution limits for county office in Humboldt County. AMOUNTS - what should the caps be and should they differ for different seats? For instance, $750 for local races and perhaps $2,000 for county races? CANDIDATES VERSUS INITIATIVES – some have indicated they would not support donation caps for initiatives, but would for candidates. STACKING - should husbands/wives, employers/employees, unions/members be able to stack donations (write separate checks)? IN KIND / AUCTIONS - what about those who donate food for an event or an auction item? ESCALATOR CLAUSE - there should be an automatic rate adjustment tied to the Consumer Price Index or some other escalator. So let’s start the dialogue now … let’s begin by asking all candidates for local office to impose limits on donations. The next step is to gain consensus on the details for a county ordinance to stop future campaign finance abuses. Local democracy and the integrity of local elections is at stake. I just noticed Mike Downey has a partial list of people endorsing him for Sheriff up on his campaign web site. It doesn't specify partial on the web page but I don't see a number of names of people I know are supporting him, my own and the Matteolis being a few of them. Then again, maybe mine is one name a candidate wouldn't want seen on a list of his or her supporters? Hmmm...??? I thought this might be someone pulling off a spoof when I first saw and read of it over at Humbug's place, but it's true. Bonnie Neely is actually holding a fundraiser for her re- election campaign in Sacramento. That certainly deserves a copycat post from me. Unbelievable. This has to be a first in a county Board of Supes race. I'm not sure what words describe it best: Balsy? Arrogant? Well, shameless certainly applies, if only because Bonnie was one of the proponents of Measure T. You know; the old Vote Local Control folks that wanted to prohibit campaign contributions in local races from "non- local" businesses. I'm sure we won't hear any criticism of this fundraiser from the local lefties, though. After all, they aren't really concerned about outside money or influence in local elections, as long as it's for their candidate. I would think most local folks would at least see it as tacky, though, if nothing else. After all, wouldn't it be a bit tacky for a candidate for Eureka City Council to hold a campaign fundraiser in Fortuna? Seems to me it's pretty much the same sort of thing. Addendum: The North Coast Journal's Blogthing picked up the issue and there's been some discussion. Interesting commentary I found in the Santa Rosa Press- Democrat yesterday morning. The author makes his case for environmentalists to take another look at their opposition to offshore drilling. The 63% figure surprised me as I'd read a few years ago that 25% of the oil in the oceans was due to natural seepage. As you can imagine, I got a little annoyed when the writer starts in with the global warming thing. Then again, if you're trying to make a case to fellow Believers, it makes sense to throw global warming into the mix. Of course, no mention of the billions of dollars that could be made by American companies and American workers from offshore drilling, but that makes sense. Environmentalists generally don't care about that.